The coastal home with everything is available BELOW pre-listing appraisal price! One level with lots of space; privacy, but walking distance to restaurants, shopping, golf, and entertainment! 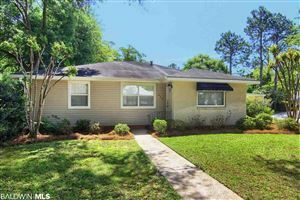 Close to the Beach, the Wharf entertainment district, and the new Orange Beach schools. Just across from the private community pool and down the street from PRIVATE BOAT LAUNCH, slips, and Captain's Cove water facilities! Large home provides a great room with fireplace open to the Florida room and the large eat-in kitchen. The master bedroom with walk-in closet has a large luxurious bath and is separated from the other bedrooms for privacy. All the storage you need, and all the peace of mind that comes from NO FLOOD ZONE, new AC, and a well-maintained home so close to everything the Coast has to offer. Welcome Home! Information herein is believed to be accurate and timely, but no warranty as such is expressed or implied. Listing Information Copyright 2019 Baldwin County Association of REALTORS®, Multiple Listing Service. The information being provided is for consumers' personal, non-commercial use and shall not be used for any purpose other than to identify prospective properties consumers may be interested in purchasing. The data relating to real estate for sale on this web site comes in part from the IDX Program of the Baldwin County Area Association of REALTORS®, Multiple Listing Service, Inc. Real estate listings held by brokerage firms other than COMPANY NAME are governed by the MLS Rules and Regulations and detailed information about them includes the name of the listing companies. The MLS data was updated on 4/18/19 2:06 PM PDT and a statement regarding the source of the listings.